The Rack comes with two towers that are powered by electric over hydraulic and can easily slide around The Rack to pull from any direction with ten tons of pulling capability per tower. The rack comes with a tool board/bench for the universal mounting system and a multitude of tooling and mounting brackets. 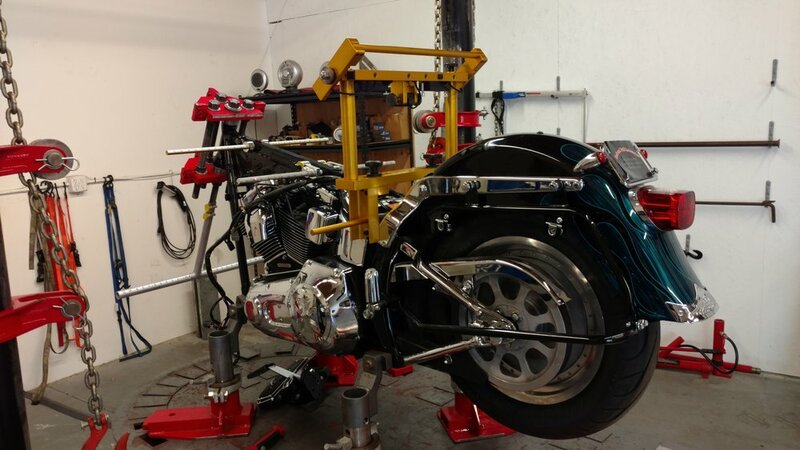 It can mount and hold steady any motorcycle for frame repairs. When used in conjunction with the Straight Shooter Live Laser Measuring System, it has the ability to straighten any motorcycle frame, (Unless it has a cast aluminum tube frame, which can't be pulled). The Rack comes with a two piece aluminum ramp that’s sturdy yet light enough to be picked up and stored away when not in use . 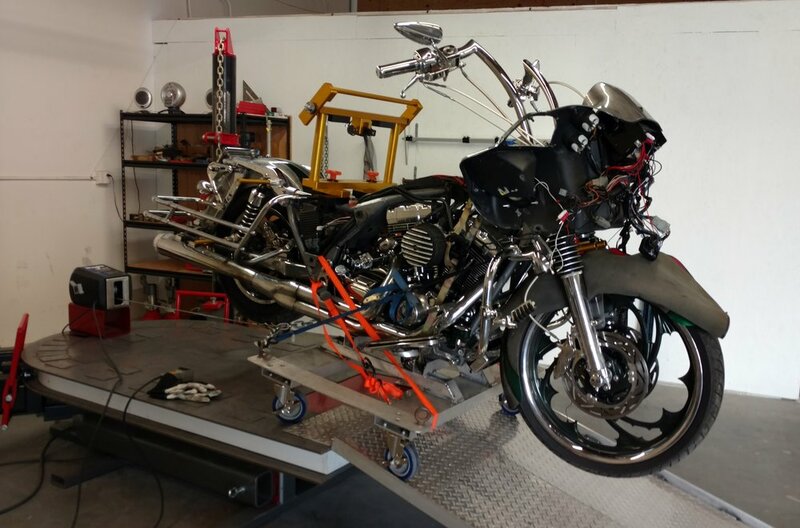 If the motorcycle cannot be ridden up the ramp due to excessive collision damage, there is a dolly and winch system to effortlessly pull the damaged motorcycle on to The Rack for repairs. 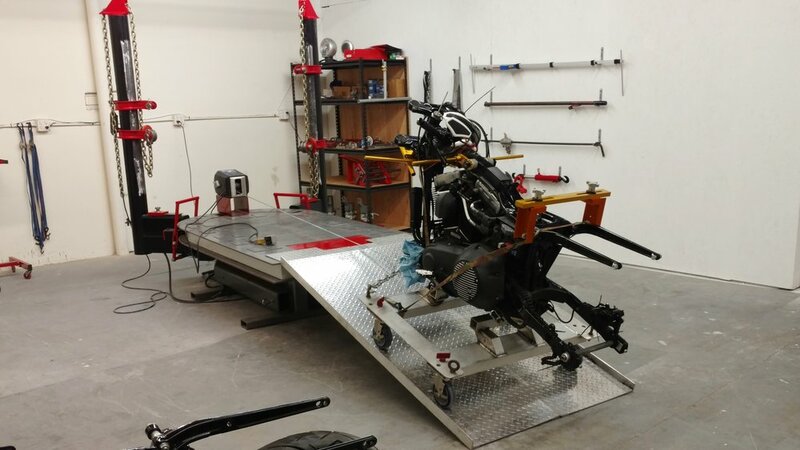 Once the motorcycle is on The Rack there is a variety of pull clamps, brackets and straps that can be used to hold and pull the frame back to factory specs again. The Rack can also be used as a service rack. There is a rear drop panel that unlocks and easily slides out for a technician to remove the rear wheel. The days of waiting for another shop to do their job so you can finish yours and get paid are over. Now you have the opportunity to become a certified motorcycle frame repair technician through Rack and Pull industries. This will help your shop capture more collision repair and increase your bottom line. This is your opportunity to lead the industry, and become known as the motorcycle frame and suspension alignment specialist! 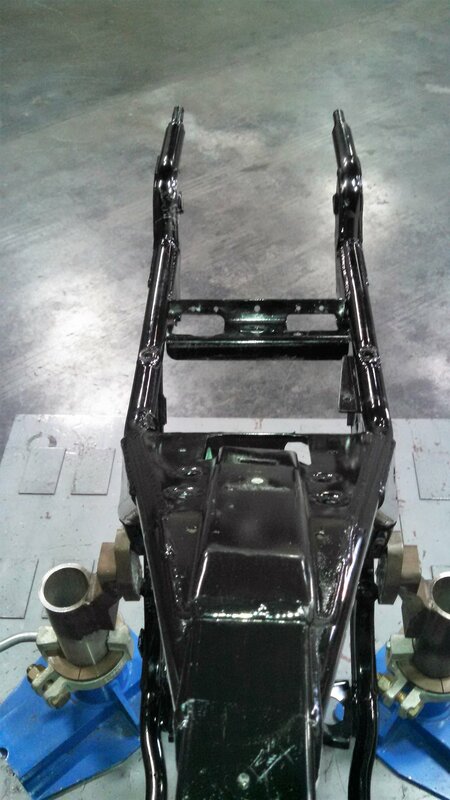 Contact Rack and Pull Industries to inquire about becoming a Certified Motorcycle Frame Repair Technician.